Photograph 1 - San Francisco's tallest building "Transamerica Pyramid" The top 13 floors are not used, however it is designed to balanced the building during an earthquake. The foundations are ball/pivot joints that can "rock & roll" during a decent shake up by mother nature. Photograph 2 - Sentinel Building (the green structure - is made of copper that is now green patina), San Francisco - home to Francis Ford Coppola's studios. 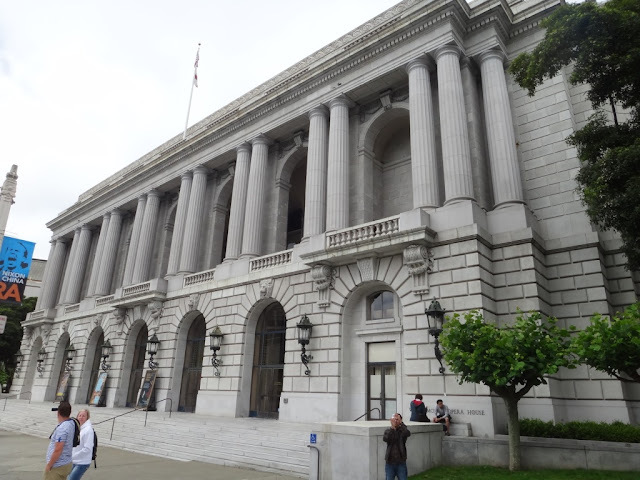 This building is fairly old and survived the 1906 earthquake. 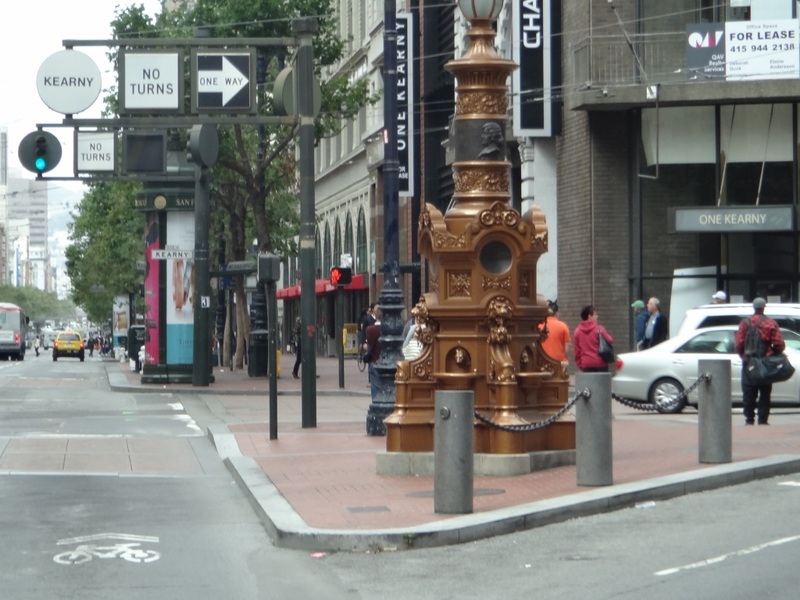 Photograph 3 - Lotta's Fountain, San Francisco. 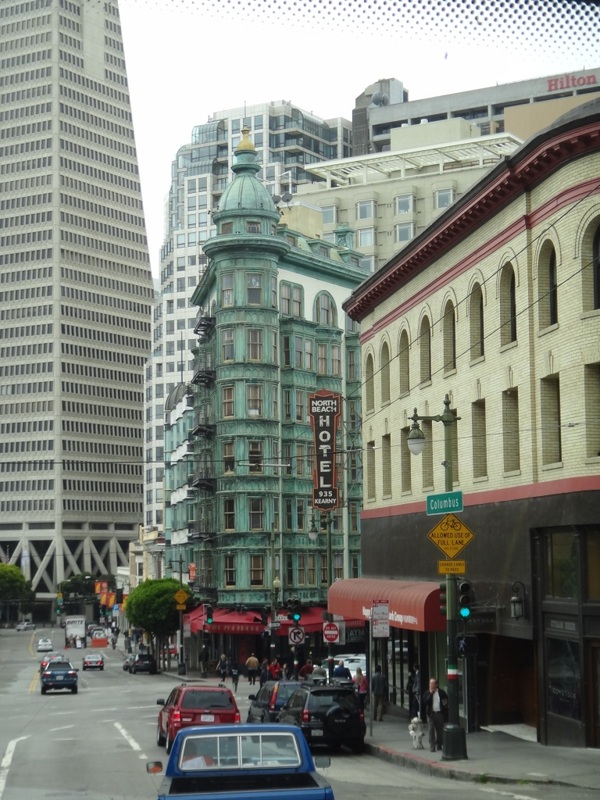 It was a meeting place immediately after the 1906 earthquake where survivors would gathered. 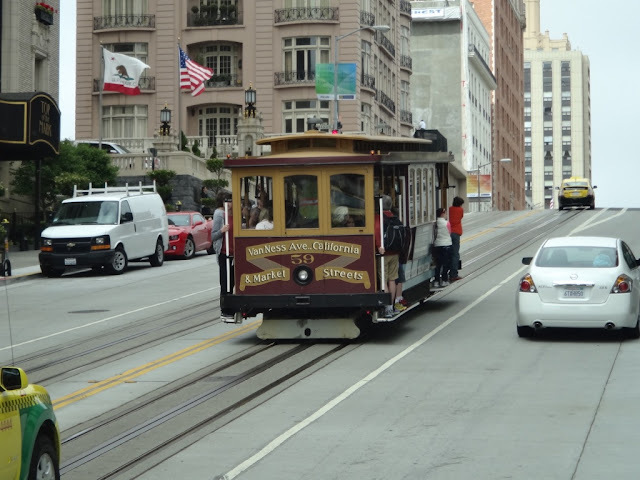 Photograph 5 - One of San Francisco's famous cable cars. Don't stand in front of these vehicles on the hill. Due to the cabling system they can't stop. 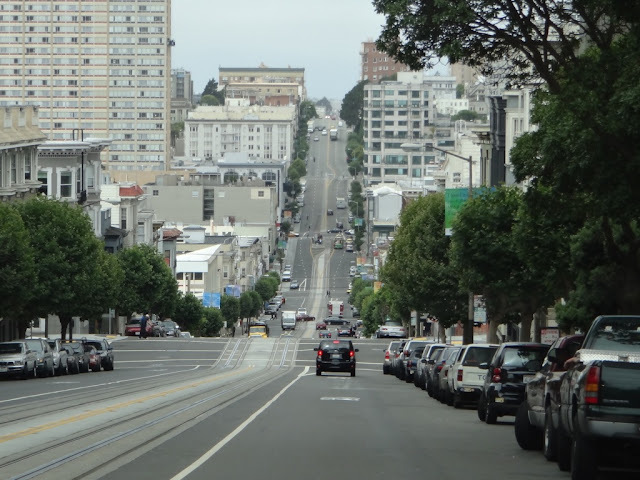 Photograph 6 - We think this is the famous Lombard Street, San Francisco heading towards Nobb Hill. Photograph 7 - San Francisco Opera House. The tour guide told us this is where Julia Roberts in Pretty Woman attended her opera experience in the film. Photograph 8 - Steiner Street, San Francisco. These houses are used frequently in movies and TV series. 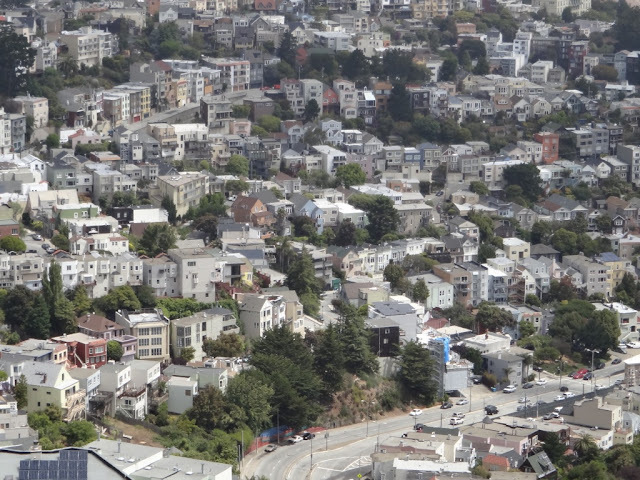 There is a park across the road called Alamo Square where most filming takes place. The houses are Victorian and are called six sisters. 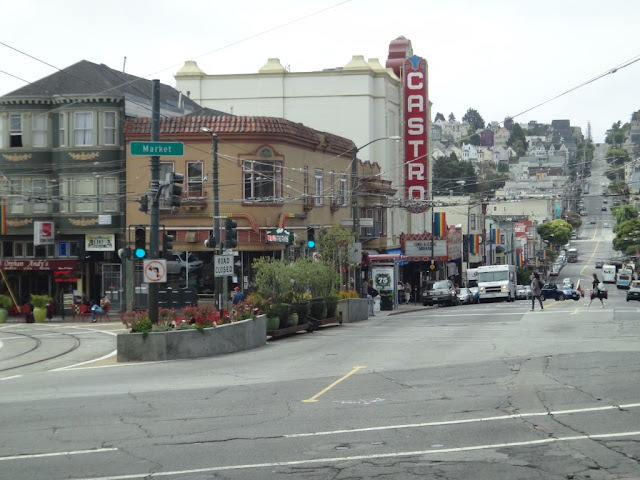 Photograph 9 - Castro Theatre. This is the home and the beginnings of the beatniks and hippies (For those who know who they were when they were in vogue during the 60's). Now this is a strong gay district and the market square on the left is famous for its nudists who just sit and enjoy the freedom allowed in this area. No we didn't see any bare naked humans - apparently we were too early. Photograph 10 - San Francisco's downtown and CBD taken from the highest hill - Twin Peaks. 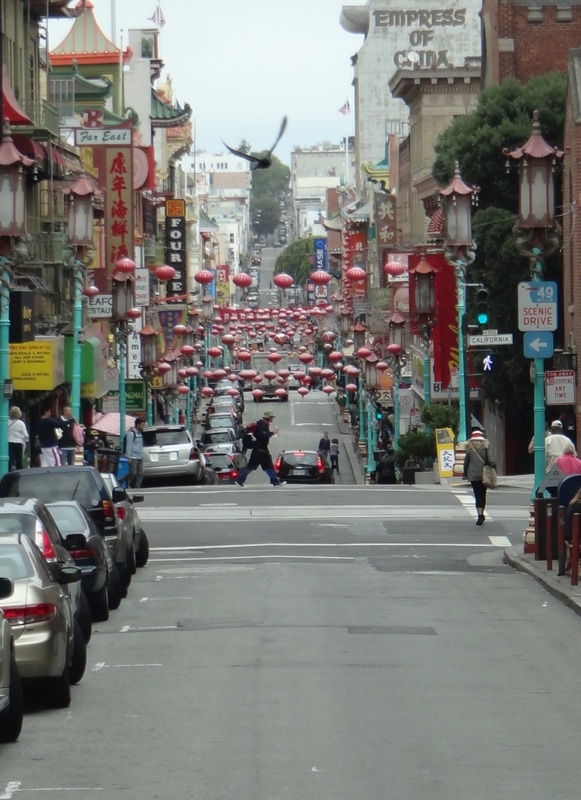 Photograph 11 - A typical scene of central San Francisco. Real estate is very expensive here. The city itself has a single population. The married folk live out in the suburbs. In view of this there are over 4,000 restaurants in SF (nobody cooks at home), no parking space for vehicles and many flats/units abound. 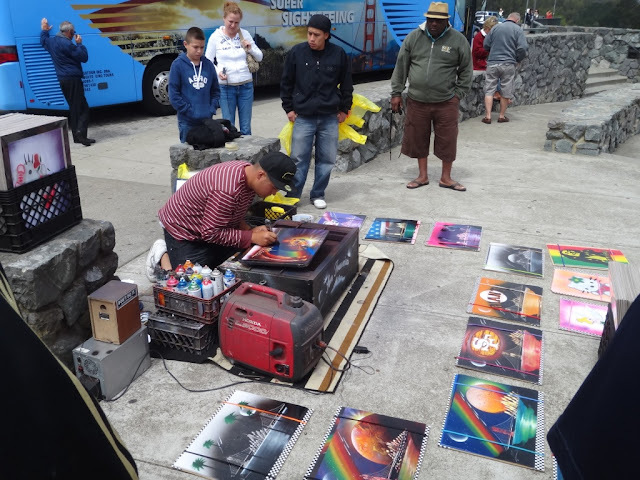 Photograph 12 - This artist was selling his paintings on Twin Peaks, San Francisco. Why is he so different from other artists? He is actually an ex-graffiti convert turned painter......his paintings are created by spray cans. 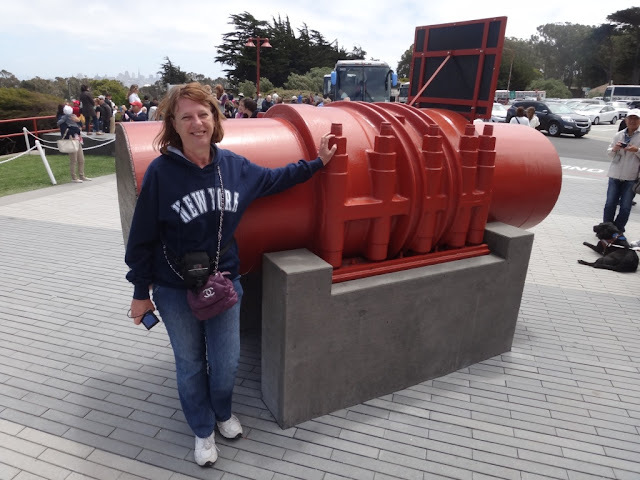 Photograph 13 - Anne next to the Golden Gate suspension cable exhibit. It's thickness is awesome. 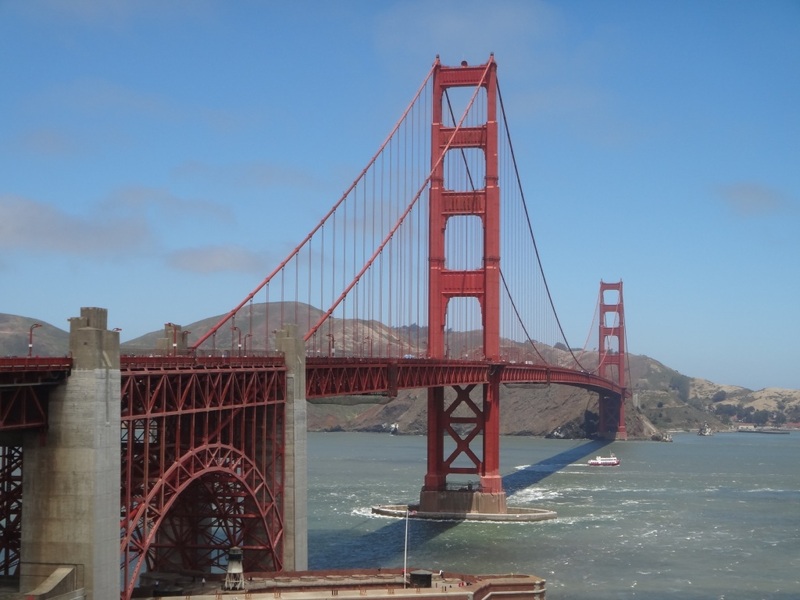 Photograph 14 - We stopped at the Golden Gate Observatory - on the southern aspect of the bridge. This is an excellent and rare picture due to the clarity without the persistent fog that covers the bridge. The bridge can actually move 28 feet side-to-side in high winds - scary for pedestrians crossing the structure. Photograph 15 - The Bay Bridge linking Oaklands and San Francisco. There was a shoot out this morning at 2am between the police and a crazy person on this bridge. 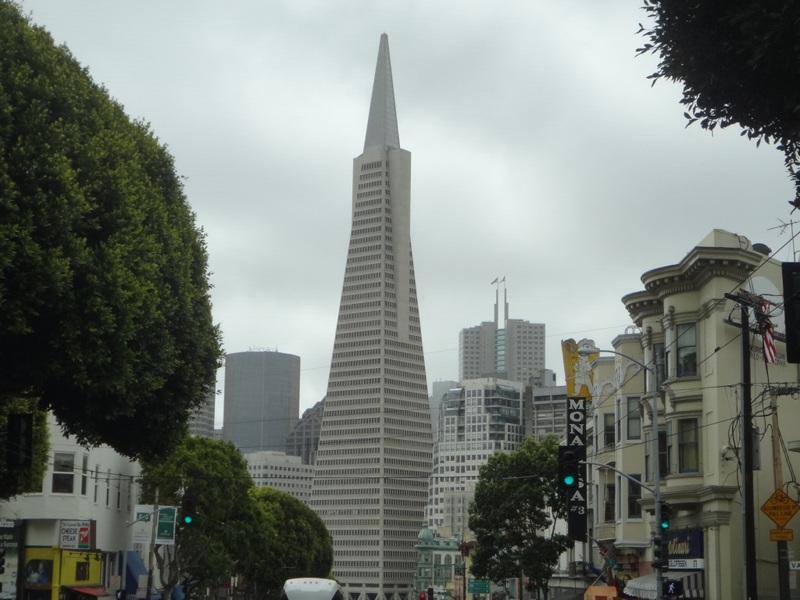 The structure was closed for many hours causing a gridlock throughout San Francisco - including us. The bridge is double-decker and moves over 400,000 vehicles each day. They are building another cantilever bridge on the eastern side of this structure - due for opening in 2014. 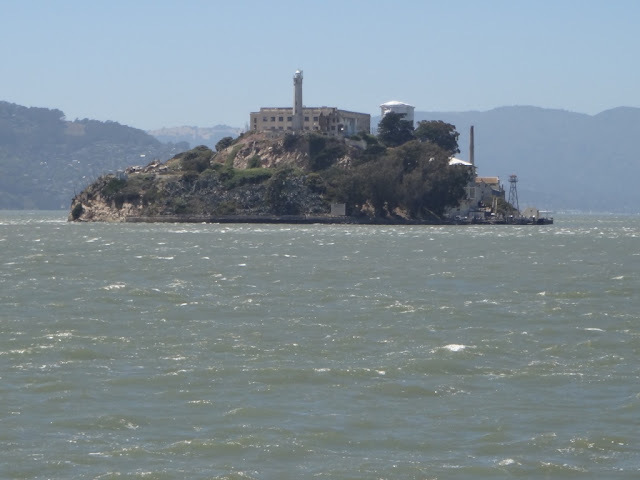 Photograph 16 - Approaching The Rock (Alcatraz). The water is very cold and inhabited by leopard sharks. Not a good thing from escapees when it was a prison (1934-1963). Prior to 1934 it was an Army fort (since 1852). 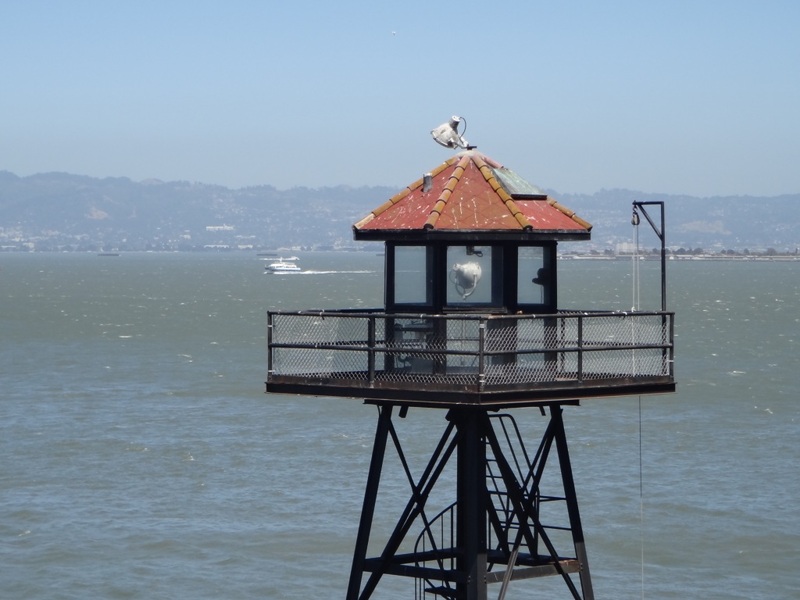 Photograph 17 - A watchtower on Alcatraz. The land fall in the background is Oaklands. Photograph 18 - Alcatraz normally holds 350 notorious inmates. 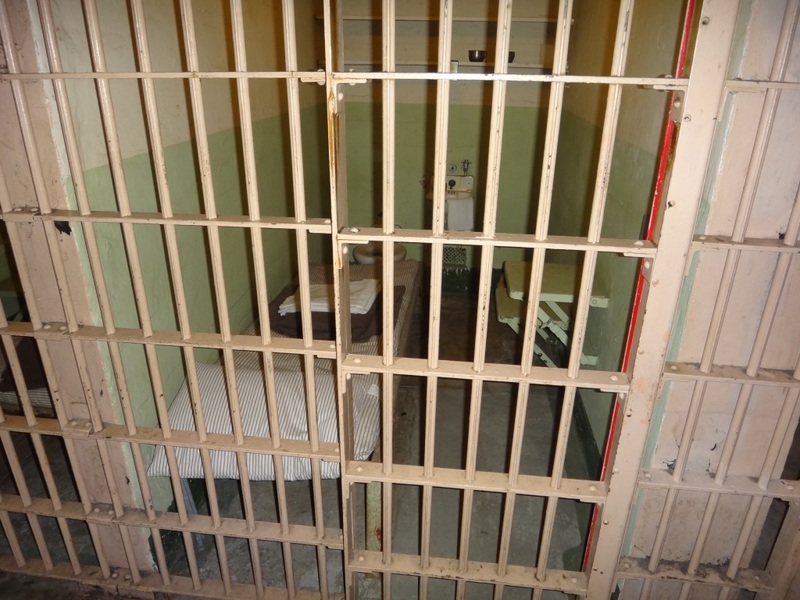 There were 4 blocks and an isolation block within the cell building. This is a normal cell (A Block). It could have held Al Capone or even Stroud the Birdman of Alcatraz). They did move prisoners to different cells from time-to-time. 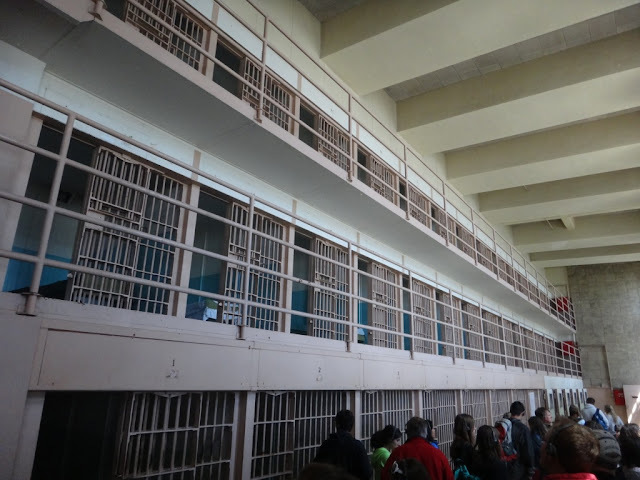 Photograph 19 - This is a view of B and C Block (triple-decker) in Alcatraz. Photograph 20 - The pictures above tell the story who were infamous and were invited by the Federal Government to stay at this "luxury" establishment. 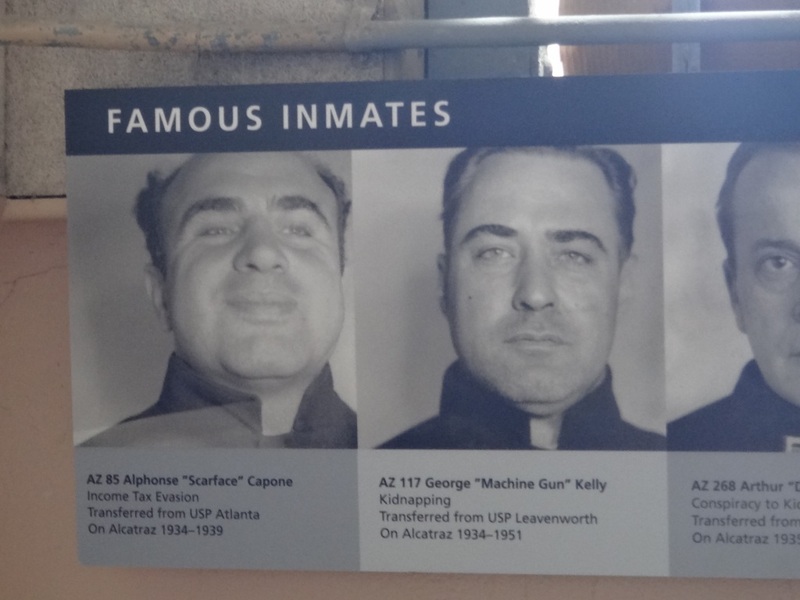 Only 1500 prisoners ever stayed at Alcatraz - murderers, bank robbers, tax evaders, rapists - but what was in common they were all notorious and extremely dangerous. 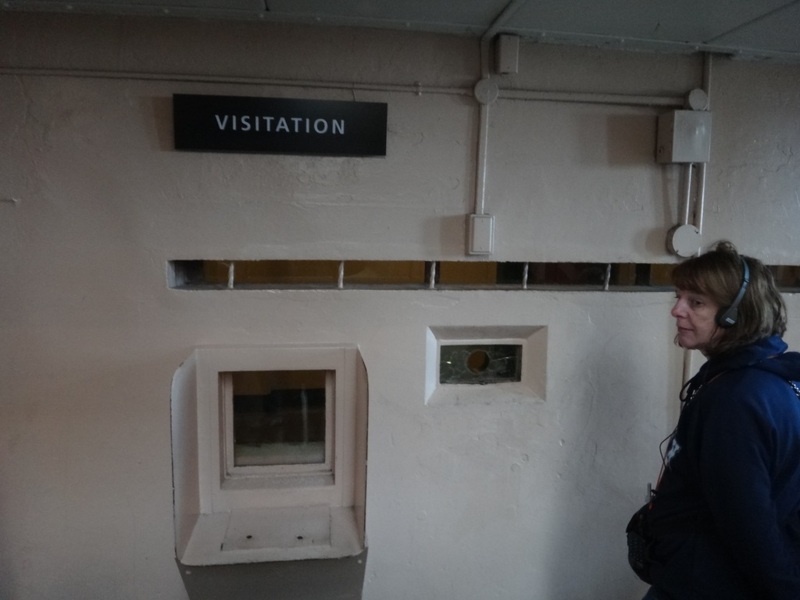 Photograph 21 - Anne listening to the audio coverage of Alcatraz and looking at the Visitation Room. The small speaking apertures were screened by thickened glass making conversations hard to hear unless shouting. 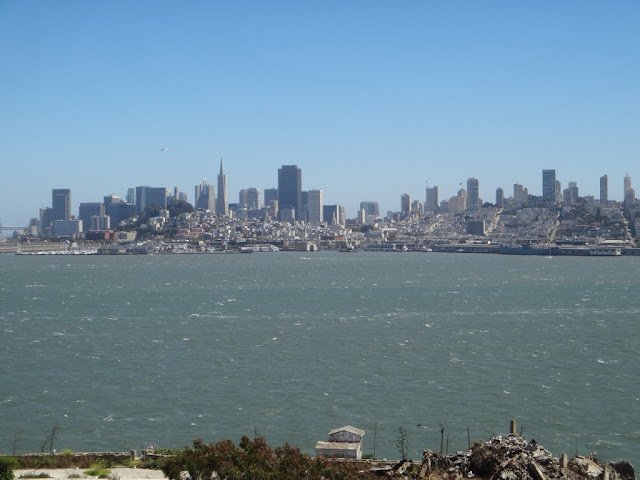 Photograph 22 - An excellent picture of San Francisco from Alcatraz. The skyline is unique. Prisoners have stated that on quiet days they could hear voices from the mainland when in their cells. The sounds were people having fun and laughing making prisoners more depressed. 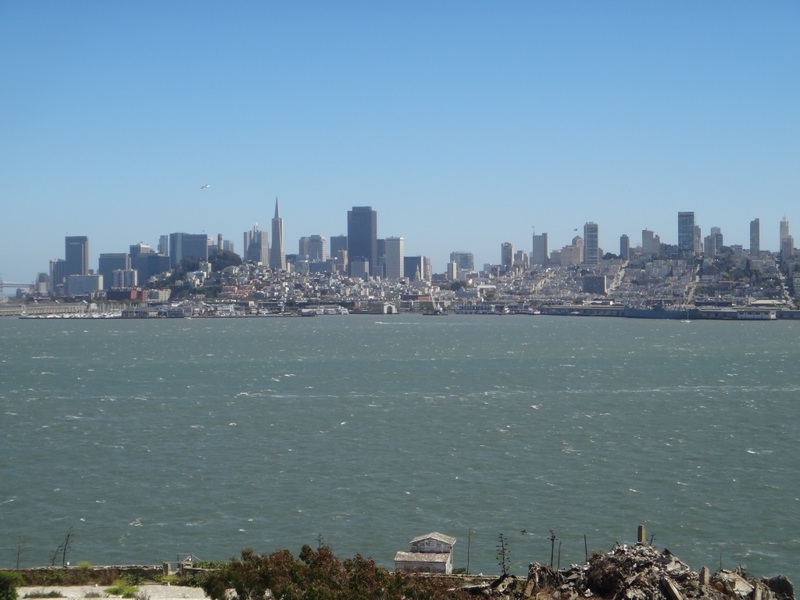 Photograph 23 - A panorama view of San Francisco and the Golden Gate Bridge from Alcatraz. Photograph 24 - Fisherman's Wharf, San Francisco. 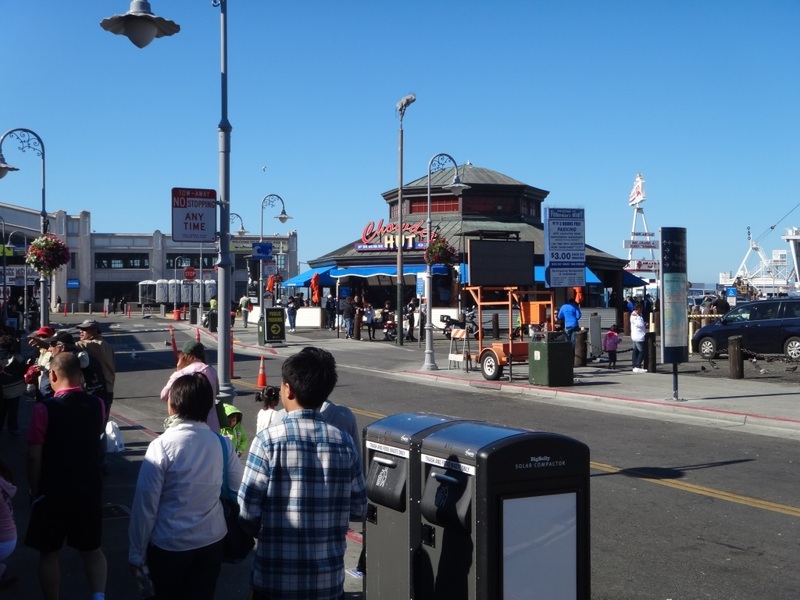 This is SF number one spot for tourists and locals alike who want to indulge in excellent seafood meals. Also it's the hub for all forms of entertainment including concerts. To finish today's post we'll briefly discuss our day's events and special moments. We left Pacifica fairly early to face an unexpected traffic delay. 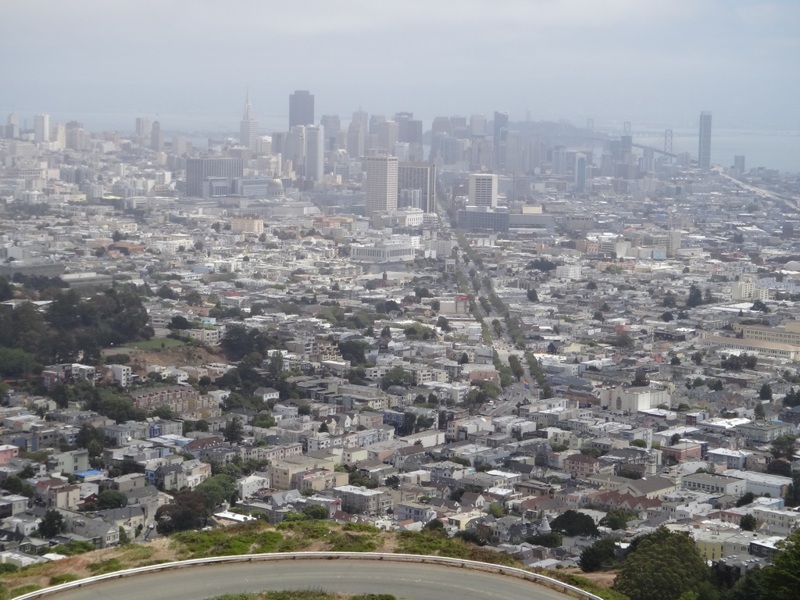 It is 30 klms to our pick up point in San Francisco and we gave 75 minutes to cover that distance. Well we just made it - how come the slow journey? Some inconsiderate person last night decided to shoot it out with the police (troopers) on the Bay Bridge. 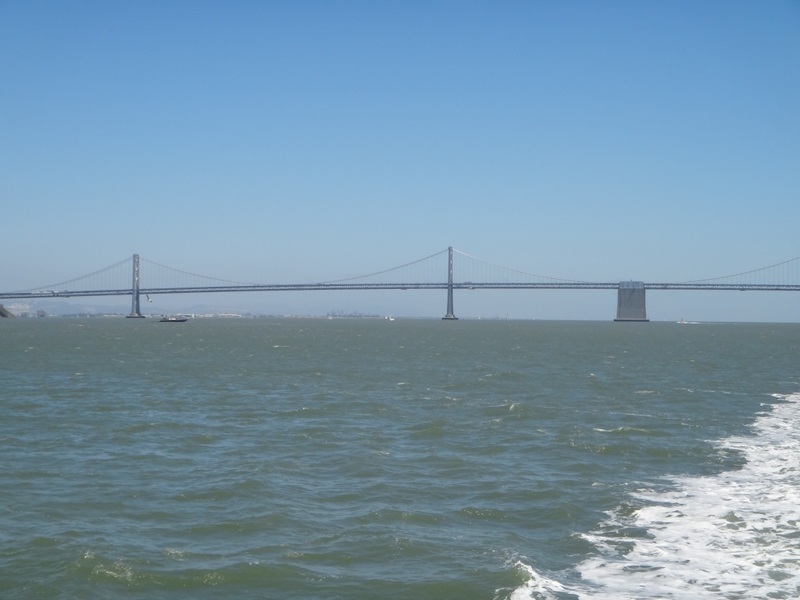 The Bay Bridge is a vital connection to the centre of San Francisco and when we had ten klms to go a sign over the freeway stated there was a three hour delay crossing the bridge. The crazy shooter started his rampage at 2am (remember the 4th of July activities was yesterday). Anyway he stuffed up the entire road system but we made it on time. On arrival the tour reception guide said we had missed the bus - it was 9:40am we interestingly we had a 10am bus tour thus we started to panic and quickly with a touch of anger expressions questioned his statement. It was immediately resolved when another person higher up the food chain apologised and sorted it all out. From that point all went well and tuned out an excellent day. The tour around the city was very informative and the guide extremely knowledgeable. In the afternoon we had tickets to go over to Alcatraz and also was great. We had an audio tour of the Rock with actual voices from past inmates and guards giving us details of famous and infamous events that occurred on Alcatraz during its 29 years service. It was weird standing on the same spot where Al Capone was incarcerated and where murders had taken place. Returning to Pier 33 from the Rock we walked to Fisherman's Wharf and had the most "best...est" seafood dish on our holiday. To sum it all up today... we had excellent weather (San Francisco is also cold, even in summer) the sky was clear and very minimal fog. We were glad to have purchased the Alcatraz tickets back in January as the tour is booked out until 20th July 2012. 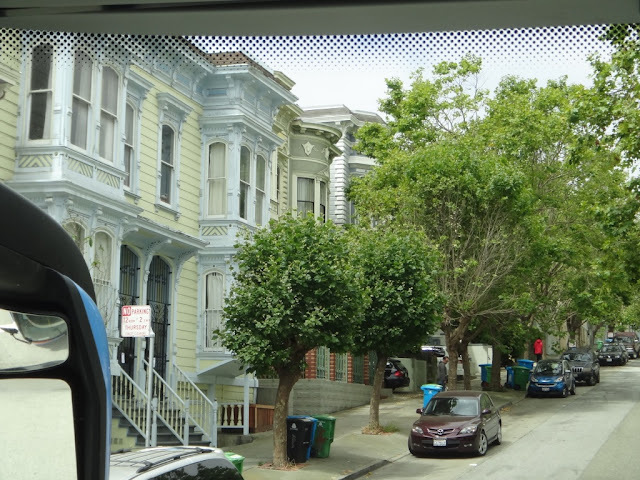 It is San Francisco's No.1 favourite tour. One last thing....this was heard from a adult American in Fisherman's Wharf speaking with his wife/partner: "Do you know what's inside a prawn cocktail?" A stunned female looked back in dismay! The answer from her partner was: "prawns". He was as serious as American apple pie - true. We believe he thought it was an alcoholic drink!!! What do they teach in American schools?? Tomorrow is a rest day. Anne wants to spend some Macy money (for her birthday) and just relax before our long long journey to LA the next day. See yah all - cheers.